I learned so much from this interview that afterwards, I went and revamped my entire email marketing autoreponder sequence. The information from this interview with Dan Faggella is that good and I guarantee you’ll learn something from it. Dan runs the popular site ScienceOfSkill.com, where he sells Brazilian Jiu Jitsu training videos online. He also runs 2 other online businesses at TechEmergence LLC and CLVboost where he helps other businesses improve their email marketing. How Dan segments his email list to maximize conversions, open rates and clicks. You’re listening to The My Wife Quit Her Job podcast where I bring in successful bootstrapped business owners to teach us what strategies are working and what strategies are not. Now, this isn’t one of those podcasts where we bring on famous entrepreneurs simply to celebrate their success. Instead, I have them take us back to the beginning and delve in deeply into the exact strategies they used early on to gain traction for their businesses. If you enjoy this podcast please leave me a review on iTunes and enter my podcast contest, where I am giving away free one on one business consultations every single month. For more information, go to www.mywifequitherjob.com/contest and if you are interested in starting your own online business, be sure to sign up for my free six day mini course where I show you how my wife and I managed to make over a 100K in profit in our first year of business. Go to www.mywifequitherjob.com for more information. Now onto the show. Welcome to The My Wife Quit Her Job podcast. We will teach you how to create a business that suits your lifestyle so you can spend more time with your family and focus on doing the things that you love. Here is your host, Steve Chou! Steve: Welcome to The My Wife Quit Her Job podcast. Today I’m really happy to have Dan Faggella on the show. 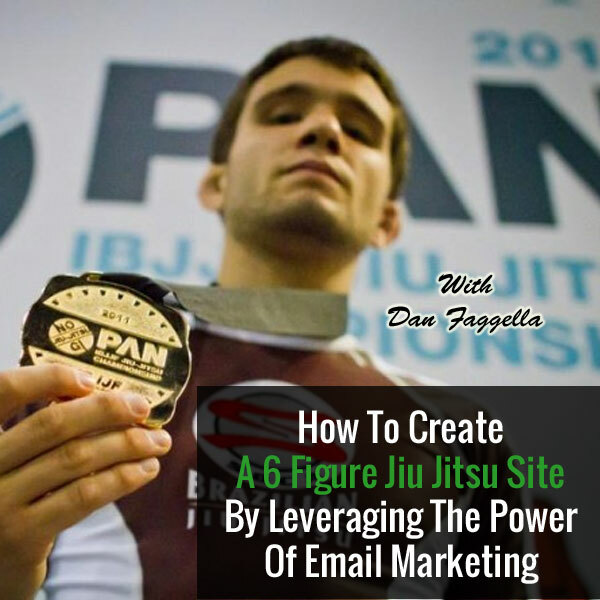 Now, Dan runs ScienceOfSkill.com where he runs a blog and a six figure online store selling Brazilian Jiu Jitsu training videos. So here’s what’s interesting about Dan, he’s been studying BJJ which is Brazilian Jiu Jitsu for all of you guys who don’t know what it stands for since 2005 and owns his own BJJ Academy in Rhode Island which he started which he started when he was a student at the University of Rhode Island. Now he’s placed in the top three in many Jiu Jitsu tournaments around the world, but here’s the thing, I have a lot of friends that are really into BJJ and Dan is not the number one BJJ practitioner out there and he’s not like the champion of the world in this sport, now don’t get me wrong, he’s really awesome at what he does but the thing is– is that when I ask my friends who are into BJJ, they’ve all heard of him because of his online presence and all that he has done for this sport. Now, within the BJJ community, the guy is all over the place. Now, he’s created this amazing community and he’s an expert at what he does, and in fact he’s the perfect example of taking a skill that you have and creating a profitable business around it. So, welcome to the show Dan, looking forward to hearing your story. Faggella: Steve! Glad to be here my man! Glad to be here. Thanks for the– such a warm into. I don’t think I’ve ever gotten one that good. Steve: Clearly you’re doing something right in your own part of [Inaudible] [00:02:47]. Faggella: Yeah, yeah we have– we do you know, 700 blog posts and now 350 videos later somebody’s going to– somebody’s going to hear something I guess. Faggella: Yeah, yeah it’s just to focus on that particular stuff. Again, I never pretended to be Marcello but we certainly focused on– and at least being able to share our material with just as many people. Steve: Yeah. So give us a quick background story? Tell us you know, tell us how you got started with this, and how you make a living online. Faggella: Yeah, exactly. So interesting tale as you had mentioned you know’ it started with a very small Martial Arts Academy in Rhodes Island. So basically here’s how it goes, I mean, I was in the University of Rhode Island–very little town I mean 8,000 people or so in my town of Wakefield, URI is in Kingston. And URI has a significantly larger population at the university alone than my entire town. And you know, I ended up getting into UPENN because I’m very interested in human potential and psychology for my Masters, and at the time I was kind of running like a fight club in the back of a carpet store just because you know, I like fighting more than working and I was getting a couple of bucks for private lessons so that was cool. And then I got the bill from UPENN and I was like, ‘Men! That’s pretty wild I guess I better– men! I better make some money or something.’ So, I was like men! This Masters Degree isn’t cheap if I decide to join. So I ended up turning that thing into a real Martial Arts Academy and teaching Brazilian Jiu Jitsu and driving back and forth from Pennsylvania to Rhode Island while I was running that thing and then, while I was kind of growing it right after I graduated, we had our roof collapse at the gym, and I was doubling a bit in internet marketing but at that point I realized, ‘Men! You know what? If I’m counting on this many square feet of map, in this town of 8,000 people for all of my income, I’m in a pretty rough spot. So I decided to take– you know, I’d won enough– I’d put enough shinny stuff up on the wall at that point you know, from national tournaments and whatever, I was to–to, you know, to be able to share some expertise online and so we started building that as a more serious presence and pretty soon we were doing more per month than we were in the physical– the physical gym. Steve: So your physical gym eventually you– you decided to sell that is that correct? Faggella: Yes it is. Yeah I sold that in maybe around year or so ago. I’m still teaching there for a little bit right? It’s now like a larger mat. You can’t exactly just plug in a new owner and have it work the same. But– but yes, so I sold that about a year ago and then I moved up to [Inaudible] [0:05:20] essentially all the stuff that I used to sell the gym was– because we automated the marketing very well and we did email marketing really, really well with software for that business so it made the sale easier because a lot of it was [Inaudible] [00:05:32] and those same systems, those exact same systems, put to a bigger scale with the entirety of the online BJJ community ended up picking up very well. So I had to become very neurotic about how to make the most of every lead, how to maximize profit per prospect when I’m in a town where I run out of human leads very quickly. So when I took that to the internet where there’s more people, it grew and I was able to carry that thing right up Bosnia after I sold the physical one and now obviously we do a kind of consulting in that world but– but yeah so the physical one is now sold, but I still go down there and train sometimes. Steve: Okay, so what does your company sell exactly? Faggella: Totally yap! So what we sell now just to kind of make things clear for the folks out there, there’s a lot of models you can do with selling information. So we’re an information marketing company. We’re not primarily selling like you know, uniforms and things like that. I’m not all that big on inventory, so we sell information. So primarily we sell downloadable video courses about very specific niche components of Brazilian Jiu Jitsu for example, if you want to know how to do a particular leg lock, or you’re interested in you know, beating bigger opponents with chokes or arm locks or something like that, we’ve very, very specific niche courses and a lot of my staff because I walk around about 128 pounds, is you know, how a smaller guy can beat a bigger guy. So we sell niche videos courses and subscription memberships to a particular niche BJJ skills. Steve: …looking around. Yeah, so how do you kind of distinguish yourself from the rest of the packing? How do you stand out? Faggella: All day. Well, a couple of things. Number one, I like to think and there’s a couple of guys they’re okay marketers in that space and I basically know all the guys that are really in that game and they’re all really nice folks but I like to think on the aggregate, we just put a lot more attention first and foremost into our funnel. So in other words, when we collect a lead we can make that a more profitable lead than most of the people simply because our follow up is really dialed in, or our automatic sequences, and then our, you know, broadcast messaging in our kind of continuous circulation of various products and services to our sub segments. So maximizing profit per prospect is a big thing for me but in terms of positioning which is probably what you’re talking about, ultimately, my shebang is this; you know, there’s a lot of people and Steve, this is– this is a really curious thing about sort of teaching your passion is a lot of people do only want to learn from world champions so oddly enough, me, Dan Faggella, you know, when I watch BJJ, I’m not watching really anybody besides you know, the Marcello Garcia’s and [Inaudible] [00:08:12] and the [Inaudible] [00:08:14] is that the world– I mean, I paid for private lessons with a lot of those kind of guys and seminars and what not and I really only tune into that. But, most people aren’t actually like that and a lot of people will really resonate with the small town 128 year old white dude who, you know, who competed nationally and like has a bunch of videos of you know, screaming Brazilians with their legs getting torn off you know because, he’s on their leg or something right? So, a lot of people resonate with like the you know, small town kid who kind of had to figure things out on his own and had to train with a bunch of white folks in a tiny town and really [Inaudible] [00:08:48] in his training to figure out how to beat all these who are you know, bigger. So they kind of resonate with the struggle, they resonate with the story, and so for me it’s beating bigger opponents and it’s also sort of you know, training I guess for the guy who doesn’t live in the heart of Rio and you know, trains seven days a week like a killer but still wants to get better right? So skill development at UPENN was my focus so, that’s a little bit of the angle but it’s mostly you know, how a regular dude can kind of beat bigger stronger folks and that’s really the angle, beating bigger, stronger opponents is the major thing. Steve: Okay, yeah, I noticed that on your site, there’s a lot of personal stories and a lot of personal videos on there which kind of, you know, allows me to get to know you a whole lot better and in that way it might make me more attracted to learning from you as opposed to some of the bigger names. Faggella: Yeah, that’s exactly it. I mean, again, this is all just marketing right? I mean, I didn’t make any of that stuff up, I mean, there’re is a– you know, the things that I think we can sometimes do better than the world champion guys, and you know, I love and respect all those guys, I mean I pay bunch of bucks for private lessons with you know, a big long laundry list of world champions but you know, there’re obviously I mean, my main focus was getting into you know, intravesting and other things like that and scaling in internet business. Their main focus is mostly, you know, growing their Academies and winning national tournaments so they’re not going to invest a ton in let’s say creating a whole bunch of little niche front end and tiny products so that anybody with a credit card can kind of take a step through the front door and really get a feel for their products you know, they’re going to create a DVD set here and there but that’s it. They’re not going to take the time to do a million different tiny front-ends to attract a million different people and they’re also, you know, not necessarily going to sit there and kind of lay out their tale in kind of bigger personal pieces to sort of build that bond and relationship simply because you know, that online business usually isn’t their main priority. So people see that with me and they do get to know me as a character. They get to know me as this you know, funny little guy in this tiny town who you know, scrapped and scrambled to make it happen and they know a bit about my story and they know that I got slammed and had back problems because I was such little guy and I was getting beat up by all the big guys and that makes them really connect with me. There’s a concept called– that a marketing teacher of mine once said of kind of getting people on the bus, so when I tell my story, and there’s other great marketers that do this exceptionally well but when I’m telling my story, I’m essentially telling individual little personal snippets about myself, and different parts and different snippets will get different people on my bus. By on my bus I mean for them to say, ‘You know what, I resonate with this guy. You know what, I like this guy.’ And those different segments that can get people on the ‘I like this guy’ bus could be that when I talk about how I came up in that 8,000 person town, could be the part that I had to drive five hours to go to all these different seminars and stuff and how I was always like the smaller kind of weaker guy. You know, so they’ll resonate with some aspect of that, and now they’re kind of part of me. They have a little bit of a relationship with me and that is I think what helps differentiate us as well. Steve: So you mentioned that email marketing is a large part of your business right? Steve: So, can you just kind of walk me through one of your funnels and how they’re structured. Faggella: Sure, so on a really basic level, we do a lot of front end past segmentation. So– and now again, we’re in kind of the consulting space and we’re clogging the same with bigger scalable businesses. But in BJJ it looks like this very simply. We’ll have a YouTube video, about let’s say a leg lock technique so you know, hey, I want to learn how to do a leg lock or something. I got a lot of competition videos doing that kind of funky stuff, so people look it up on the whole of YouTube and at the bottom of the leg lock video is a link, and the call to action on the link is a free eBook or video course about, you can probably guess it Steve, leg lock! For crying out freaking loud! And then once they land on that page, we’re testing that squeeze page if we’re doing our job correctly, and getting people to opt in for leg locks and then once they opt in– so the– bringing them into the email sequences is just as important as the communication, just to make that clear. I mean, I’m passing the segmentation, anybody who will watch that video, who will click that link, they’re into leg locks enough to be at least in the market to potentially buy. I don’t know if they have a card yet, but they’re at least in the market. So they’ve opted in and I already know their interface, they’re not a ‘BJJ lead’, they’re a ‘YouTube I’m into leg locks and watching leg lock videos lead’. Which means if I’m trying to sell you leg lock videos, there’s a decent chance you’ll at least consume that content? So that’s a good box for me to check before I start pitching. So, what happens is, they’ll end up getting let’s say a 24 to 36 email sequence, which will be a combination of great interviews I’ve done with world champions, exclusive educational content particularly about all the different dimensions of leg locks and how they can use leg locks, and around email five or six, we’ll have a very easy front end offer on– with– about leg locks that might be, you know, sending them a DVD or sending them a downloadable course as well as a free trial on a leg lock membership program or you know, different cool and fun bonuses all related to getting really good at leg locks and we’ll give them one of those offers. Now that offer will last maybe four or five days, and then you know, we’ll go back in education mode and we’ll go teach them some other cool stuff, other cool interviews, other cool competition breakdowns and then we’ll take another swing. Most people will take only one swing, we like to take at least three. So we’ll take another swing, we’ll do a different cool bonus, we’ll send two different DVDs and maybe there’s some other cool extras that come along with it like a drilling sheet and some other stuff to help people learn. And then you know, we’ll relate that to our educational content then we’ll go back to education and then we’ll go back into another offer at the end and that takes us about 36 emails or so. And now somebody buys one of those front end programs, then they’ll automatically go into a higher [Inaudible] [0:14:32] follow up sequence, where we’ll start to talk about 97, 77 dollar products and we’ll have maybe a 12 or 15 email sequence to move them to that level. And that will move me to broadcast and it gets a little bit more complex but that sort of a basic front end funnel is we know what you’re into as soon as you come in the door, we already know what you’re into, we feed you the best stuff we’ve got and we give you amazing deals and super cool programs about that stuff, and then we repeat that process with multiple what we call roller coasters. So it’s like it’s all education then it’s kind of you know, some cool offer stuff and then back in education then it’s a cool offer stuff and we really ride people right through those and we don’t like to give up early. Steve: So, a quick question on the initial sequence, so do you not even mention any products at all in the first four or five emails? Faggella: Sometimes. So for example, I mean, there is a bit, so every now and again, like we’ll have something in the PS, we’ll have something in the signature, that will at least be a link to it. and often Steve, in fact, probably most of the time, as soon as they opt in, there’s a thank you video, that talks about you know, why we’re literally giving away one of our leg lock DVDs, just for the price of shipping, and why you know, why it’ s a good idea to check it out, right? So often there’s an offer thrown out there right on the thank you page or on some kind of a ‘read more’ page after the ‘thank you’ page. They are exposed, but what we generally like to do is– I think about it like this in general, so, general best practice in info-products style is ‘let the hot people buy’ so if someone’s super hot, they should be able to buy, but if we don’t know if they’re super hot yet, let’s kind of heat them up a little bit and then sell. So is there an opportunity to buy? Oh yeah! Right on the Thank you– if you’re looking for it I mean, it’s there. And sometimes email two, email one in the PS there’ll be a link to the store or link to a special so, if they’re hot and they open up that first email, they can buy but we’re not going to go you know, kind of pitch mode so to speak, no, not at first. So we’re not going to pitch mode till later. Yeah. Faggella: That’s very, that’s very interesting. Now, if I’m not mistaken you’re selling physical goods? Steve: No, no, no. This is for my email train– my ecommerce training course. Faggella: Oh! This is your course? This is your course– very curious. Well, you know, I suppose it’s not all that uncommon, let me ask, I mean, is there a scarcity element at the end of these emails sequence like, ‘hey guys, you know like this is the last email about this, you know, here’s the last bonus you get’ is there anything like that? Or is it just like ‘hey, another email from Steve’? Steve: It’s a pretty straight forward– there’s no scarcity element. I was debating with myself whether to add that element because it would be in a way some sort of false scarcity element in a way right? Faggella: Yeah, you don’t have to actually I mean, I’ll tell you know, I do it in and on, I don’t like false scarcity really, but usually I will say– I’ll often say this, ‘hey, I mean, this is– this is the last email you’re going to get about this.’ So, that doesn’t say the software won’t exist but here’s the think, who the heck is going to go back into an email that got sent to them four months ago and find a crazy link that isn’t listed on Google for a special? Nobody does. So–so I won’t say this offer is going down, I’m taking down the website, I do think that’s deceptive and I don’t like to do that, but I will say something like, ‘hey guys, you know, we’re going to be headed right into some educational stuff and honestly, it’s the last mention, you know, I mentioned in the last email I want to make sure you can get in on this, because we’re moving right along into other stuff.’ You know, that kind of thing is a bit of a [Inaudible] [0:18:07] you know, last chance without you know, saying something that isn’t in fact true. Steve: That’s very interesting. So, do you have separate funnels for each one of your niche videos? Steve: So you mentioned leg locking, there’s– I imagine there’s like an arm bar video or whatever. Faggella: Yeah, yeah, yeah. You’re right so, we have a certain number of core continuity programs. And there’s sort of this principle in information marketing of splintering your offers and particularly of splintering continuity. So the idea is, we have a number of different free front end products, that people can download, like free eBooks and video courses and other stuff that we’ve created based on interviews of world champions, based on match break downs, all kinds of different content that people like to consume, and what we’ll do is you know, the opt-in for the arm bar video, the opt-in for the escape video, the opt-in for whatever, and they’ll get a very tailored email sequence leading to a continuity program. Now, we only have three continuity programs, and really true, I mean we have five total but there’s only three we care about, and then– but we have probably 20 of 18 different funnels. So those different funnels take people down different kinds of trickling paths to our core offers. Steve: Okay, wow, that’s very interesting. So your email funnel’s a lot more tricky than mine. I only have one product and it goes– everyone goes down the exact same path, they’re interested in starting an ecommerce store. Steve: But in your case, I can see how it’d be useful because many little intricate skills involved in Brazilian Jiu Jitsu, and you kind of all take them as individual splinters and you just kind of funnel them towards your three main products it sounds like, right? Faggella: This is– this is true, now, I would say it sounds like you know, I mean to be frank, this– it’s so much like you know, what Dan invented for this crazy little online business. It’s kind of like these are general best practice for maintaining the highest open rates and getting the highest [Inaudible] [0:20:01] rates and ultimately making the most profit per prospect. So for your businesses you’re learning how to build an ecommerce store, what are like the three main motivations that people are into to build an ecommerce store, some of them want like let’s say they want to it to be– you know, grow a really big business, and kind of scale it, some of them want to kind of live at home and be able to kind of take care of the kids and have some fun like yourself, more of lifestyle oriented, and maybe some of them want an income on the side, is it safe to segment folks those three ways or you let me know if there’s some other segments. Steve: That is a good question but yes, certainly those are three segments that I target. Faggella: Okay, so here’s the how this applies to your business, because again, I want you thinking like this is some fancy Jiu Jitsu trick that the folks at home can tune into. This is you know, this is– this is email marketing so for you it might be you know– so we sell all other kinds of stuff and other niches to the point of we’re being redundant if we talk too much about it but if you’re coming in for let’s say learning ecommerce store, oh, okay great! You know, what’s your name, email and what’s the main goal for you for starting an ecommerce store? Then every educational snippet, every testimonial and every call to action is all about why this is going to build your lifestyle. Every educational snippet, every testimonial and every call to action is about how you can grow this to a million dollar business. Every testimonial, every educational snippet and every call to action is all about building a great side income. So that’s how you get every single email opened at a higher rate because you’re appealing and that’s how you get higher click throughs appealing to particular values. So a simple drop down on the front end, and you can apply the exact same tenet to your business. You can do it by motive, you can do it by interest, you can do it 50 different ways but front end [Inaudible] [0:21:35] up all your opens and your click throughs, it definitely is not a Jiu J4itsu specific thing. Steve: Sure, yeah absolutely and clearly you’re very good at what you do, and so that’s why I thought I’d ask. Steve: Just curious, what do your open rates look like on some of your funnels? Faggella: Yeah, I mean it’s been a very front-end funnel and to be frank, it also varies on lead source so I imagine– I don’t know what you’ve tinkered around with but if you are getting folks from reddit and stuff like that, you know, nobody in internet marketing really does all that much with that, I mean I’m sure there’s some people that do but you know, within the first eight emails or so, you know, getting higher than 33 or getting higher than 25 is you know, pretty rock solid from let’s say either paid or Facebook. Steve: Okay. Okay, I’m sitting around 40– between 30 and 40 I think in my funnel so. Steve: I just want to gauge what a good number would be. Steve: How do you actually get people into your funnel in the first place? Faggella: This is a big question and there’s so many ways to skin this cat and it’s an interesting game. So, one of the ways we’re doing now is paper clicks. So I think that having a functioning paper click segment of any kind of online or ecommerce business is a very, very important simply because if you have anywhere you can spend one dollar and make about 50, you should have that dollar being spent a whole bunch and have that buck 50 coming in a whole bunch and you should be aiming to up those ratios and instead spend 10 bucks and make back 15. So, paper click is one channel, mostly Facebook for us right now, just giving the level we’re targeting. The next big channel for us is our YouTube channel. So, you’ve probably seen some of our, you now, stuff kicking around there on the YouTube, but we have a lot of different niche and specific videos, we’re always popping up new stuff and fun interviews and those all have specific links to squeeze pages. Another way is posting and guess posting so, earlier in the game I wrote for a while the Jiu Jitsu magazines and the bigger print publications and that made it pretty easy to get on any of the websites like ‘hey I just did an article with this world champion for this you know, Jiu Jitsu magazine in our Jiu Jitsu style on the United Kingdom, you know, is it cool to shoot you a draft of some other interview insights that this you know, seven time world champion gave me about you know, arm bars or something. You know, usually, people don’t say no to that. So you get a lot of articles up on other sites and then eventually get log-ins on those sites. Steve: Was that on purpose by the way? Do you specifically target or? Faggella: Not at all, when I started, you know, the way I learned Steve was you know, learn about your customers right? I mean start up the concept so I just called all my buyers when I got into this game. ‘Hey barber how’d you find me? What do you like?’ and you know, I decided to build stuff that these guys would enjoy. I figured that was kind of the best way for a win, win and you know, they’re all 42 year old dudes who you know, can’t train on the mat seven days a week and they have disposable income and they don’t know how to legally download stuff. So they’re the– they’re the people that buy. So we found that out and decided to rank the stuff that people wanted. So we did a lot of pooling, a lot of research, a lot of talking to our actual customers and decide to rank on things like BJJ escapes. Biggest trouble areas, a lot of people really have trouble with a couple of key positions so we use those guest posts to rank for those terms. And then some of those terms drive the most traffic to our blog and of course we have opt in opportunities right on our blog. So SEO guess post in YouTube– those are all some pretty major in bound channels for us to drive leads. Steve: Okay, and so which one would you focus on if you would start all over today in the beginning? Faggella: Oh, well, I would say focus on joint ventures so–all those are really slow man– those are slow. I don’t think we’d have a 25,000 person list if we only did those so, I mean, maybe but you know, I would have had to do that fulltime we’re doing a lot of other stuff. So, joint ventures are really big so finding a way you know, one thing that we did early on, I think this is replicatable for anybody who’s listening is we did a lot of guest posting, we became featured writers on six or so other websites, and then we went to the major players in the niche. People with fan pages, with you know 50k plus people on there people with email lists that were you know, substantial compared to ours at the time, and luckily we kind of caught a good deal in the last 12 months. But you know, they were substantial at the time in the martial arts space and say, ‘Hey, you know, I write for these six sites, you know, I’d love to interview you for a blank, blank, blank and then once you interview them if you could be an affiliate for some of their products and help to kind of spread the word on a bunch of different websites you write for. Now writing for six different websites is a hot berried entry because you actually do have to be on the right but it’s not nearly as hard as building a 20,000 person email list. So, normally in order to get somebody to mail for you, you have to mail for them. When I heard a zero flipping person email list, instead of saying I‘ll mail for you, because I couldn’t, I said hey I write for six websites. I like to interview you about blank, blank, blank and if you are able to send me email to in all this particular squeeze page you know of giving 90% of whatever you sell down this funnel. That was actually an interesting value plot and despite the fact that I was brand new fresh in the game, I was writing for six websites a day never been thought to write for, and they would have to go through the wrong address process I did and they did not write for any of the magazines I wrote for. So I had this entrenched position that was hard to get to, I had something of value to offer that they didn’t have themselves, so instead of taking the time to build a continently size email list, I gave them a hook in angle of something that I built in a matter of a month and a half and I was getting better aisle of 15,000 plus email list pomp into an opt-in funnel and that’s ultimately how we built our business. Steve: I see, so you are already writing for these six publications so you pitch people with larger lists and you give them all the revenue from any– almost all the revenue from any proceeds any sales that regenerate from them. Steve: Okay and then meanwhile you get the subscribers from their list onto your list. Faggella: This is true, this is true yes and then of course they get the benefit of hey we’ve been featured on, featured on, featured on, featured on and now they have back links back to their site from these other relatively authoritative websites so they would not have gone otherwise so it’s a win on both sides. Steve: So how do you pitch the guest posts on these six sites? Faggella: Yeah, the first thing is– the easiest way to pitch a guest post and man, I’ll surely write something about this, I mean it is so– it’s so simple though, like I use the same algorithm over and over and over again and it’s almost like sure fired stuff. It’s– I interview somebody who is a big deal, so I interview somebody who that publication would love to have unlike the first page somewhere, right who would make them look good if this person was there, because they don’t know me. They want to look good though so I pitch– I get an interview with somebody that these people would love to feature even if it’s only email correspondence and they send me back eight paragraphs about, you know, something or even three paragraphs, that’s good enough, it’s a correspondence. So I say, hey, you know I’ve had a correspondence with blank about blank, and you know, and I read this, this and this on our site recently and you know, again I just talked to this world champion and I have a feeling that you readers would seriously resonate with his stuff and I like to make it timely as well. So the world championships had just ended and you know Tenkino [phonetic] who just hacked Medes in the finals actually broke down a lot of how his training strategy worked out for that actual match, I think it will be a great thing for your spa and nobody else’s got this content, you want me to send you a draft? Very hard most of the time for them to say no especially if you’ve written for bigger publications. So I have written for blank – you see you say I have written for blank, blank, blank I have interviewed blank expert, here’s why it’s timely and here’s why you’ll the only one that will get it, do you want me to send you a draft? Very inviting very low berried entry all they have to is a yes email. You send them a draft and you do the same thing with three other people, and someone is going to buy and normally I will just write a different article for each one of them and put them up on all those websites. Now, once you are writing for these websites two, three, four times, you simply ask, hey man this seems to be good fit, you know I hate to be bothered every single time with an email, does it make sense to just have a log in and be able to kind of post some stuff up and most of the time if they post it two or three of your articles and they’ve been very good, they’ll say yes at which point you now have a log in? So when I interview xyz world champion, or xyz you know a person who wants my help with getting their content around, I take their interview, I turn it into great content and then these websites are happy to have me distribute it because I’m talking to the best experts all the time. Steve: So if you were to take a step even further back, how do you get the attention of the experts that you want to interview? Faggella: Yeah, well this is kind of a– this is a pretty easy numbers game actually, so I mean if you‘re already writing for a couple sites that’s a good way to go about it, but you know relatively simple approaches – I’ll see if I can pull up one that we did recently so – I’-l-l- b-r-i-n-g t-h-e g-r-e-y. I’ve done this in the kind of the tech niche in the emerging tech space as well, so I figure out, I mean, if even have a nominally size podcast or blog of your own and then you have, you know, two or three places that you’re going to depend to put up content, what I like to say is, it’s usually something along the lines of, hey my name is blank with blank you know whoever you are writing for. I recently saw and then you know something that they’ve done whether it’s a blog post, a competition, a video or whatever and you know, I’m going to be putting together some articles for blank, blank and blank and then you list some other publications you can be writing for and you’re like you know literary my interviews are literally 18 minutes long or so, so it’s pretty short stuff but I figure if we can catch up on Skype it’ll be great to get your name out there and I’ll be happy to plug any of your websites, your events you have coming up as you know– is there a time we might catch…? So this is the closest, is there a time in the coming three weeks that might paint out well to grab 20 minutes? Or, you know is there a time in the next two weeks that might paint out well to grab twenty minutes? A lot of the time I’ll get a yes to that, and if you do a numbers game, and you have somebody on Odesk get 24 names, you put them on a spread sheet, you set down on a template, you know normally– you normally get a really good number of people, even people like, wow man like this guy is given like 18 different ten talks and he’s like multi, multi millionaire and you know, you never think you’d talk to these guys, and you get them to buy in. Steve: That’s very interesting here, the reason why I’m asking all this questions is because I get readers who come to me and they are unable to get any traction with their blogs or their stores and that sort of thing, and often times it just borders on the leg work, right, which is reaching out and contacting people. Yeah, these people are just mainly waiting for the SEO speaker to turn on and it never does and then they get discouraged, and then here you are hassling and contacting people and getting traffic deal fashion way which kind of snow balls in the end. Faggella: Yeah it’s real fashion, I mean now we have one of the, you know, it’s not like the biggest because I never focused on it to be as such, really I care a little bit more about my email list and my monthly hits. But yeah, now we have a really good size blogs simply because we did the hassle of what we talked about we got, you know, the biggest names. I want you to check three or four boxes as you already know Steve, you’re good to kind of have a fuel in the door to interview almost whoever you want, if you do a great job. So now that I write for essentially all the sites and I’ve interviewed, you know, a good majority of you know – it’s hard to say majority it’s a lot of blackmail job there but so many done black belt world champions, it’s hard to even shake a stick out of them anymore, it’s not all that tough to get anybody else out there but the initial grind is same as the grindest today and you know it’s not all that tough but I just gave you the template I mean that’s literally what I do to get on those sites to write for them. It’s literally what I do to talk to experts. I’m doing the same thing in the technology niche now as they did in BJJ same process. Steve: Okay sounds good, so you mentioned that you have this email photo is there particular piece software that you use to help manage all these photos? Faggella: infusing guy really helps with segmentation and I’d recommend him for anybody else out there. Steve: Courses that you took? Faggella: You know I’ve always done these weird things, so I have this thing Steve, and I call it the black Lamborghini test and I don’t know if I’ve ever talked about this on an interview but it’s a very interesting habit that I have, where whenever I’m interested in doing something, I essentially find someone who is doing the same thing I am doing in terms of business but they drive a black Lamborghini. Now this is important not particularly because of the car, but because they’ve made that much money from that business. So I don’t find who has the biggest blog about how to be successful, I find who drives the black Lamborghini because of that business. So when I got into email marketing I just said, you know who is making the most in information marketing? Who is really doing it? And I found people on the martial arts niche, and I found people outside the martial arts niche and well before, you know I had the safety net to go out and do it, I invested in myself to learn from these guys. I mean I bought a Infusion soft for, you know, 2000 box down and I immediately spent six more grants to work with six division which is the one kind of top consultancies for a fusion soft for like a big two day thing for my martial arts gym as soon as I got the software. So the short story is I always found learning from the best in person to be really the way to go not the best because they have a blog that say so, but the best based on the black Lamborghini test of which I’ve already told you. And then the other thing is, you know, the people I can’t learn from the other black Lamborghini test in terms of paying for their expertise may be they are too expensive may be they are just not available. I will muddle what they are doing. So one thing I did earlier on, this is more valuable for me than any book I‘ve read. As I said, hey I am trying to build a monthly membership program that makes– that funds me and I can eventually sell and, you know, become a virtual investor in Cambridge. You know, who makes enough money in information marketing they can do that. Raso Branson [phonetic] is like one of these people. He used to have 100 employees in a call center and now it’s a little bit smaller but he’s a very big name in the internet marketing space may be you’ve heard of him. And Raso Branson has a number of different continuity programs and you know relatively similar price plans. So I said, great, what does Raso’s emails look like? What is his videos sales really look like? What is his sales page look like? And what is his kind of flow to that sale look like? Cool replicating BJJ, run in BJJ and then iterate from there. So it wasn’t a book it was iterating from best practices based on the black Lamborghini test and that not only with the biggest accelerators of my learning because there’s nothing like riding somebody else’s successful sales letter in your niche. I mean how about that for getting a good copyrighting immediately, it’s in my opinion it’s way, you know that’s the higher– that’s really good stuff so long as you understand the basic principles and then you know– and it’s a good place to start testing because somebody else is driving a black Lamborghini because if it’s so by galley, I mean unless you’re really screw it up, you should be able to get some traction. So in terms of learning that’s what I would advice anybody else out there to do. Steve: So what are some news letters that you recommend that people look at in order to gain ideas of how to do the final and the correct way? Steve: You can send these to me after this interview and I will just post them here. Faggella: Okay that’s fine, I mean, easy stuff I mean guys to follow I would say tune in to automation clinic which is a guy by the name of Jermaine Griggs. He’s probably the most famous infusion soft marketer and in terms of like his own success story. He does – I forget what he does like 12 million box a year selling essentially how to play music by ear. And that’s the business he is in, very interesting business and he’s one of the best infusion soft technicians that lives and breathes on earth. So I drink in with his guy, and then otherwise I just hop in on the email photos of Rione Dias [phonetic] and Rosa Branson. Now these are guys that are big in the internet marketing space. I’m eventually moving into other business, I’m not going to be here forever. But they do email marketing far better than most, and if you are going to pay attention to them or Josh Moore with an e-book book, I would say them. Steve: Okay that’s good news, I’ll link that stuff up. So just curious you know once the funnel is done in your email marketing sequence, what do you do with your subscribers after that? Faggella: Yeah, so I’m– [Inaudible] [00:39:22] waste to kind of again skin that cat too. So sometimes I have a funnel that’s really designed to be a front end funnel. It’s not necessarily designed for me to hit my current list with, but you know I can test it before I start paying for traffic to send to that funnel, but you know, one thing that I do if I want– if I build something like for example I just put together the copy for a sales pay join take downs it’s not all that long ago, and it’s going to be this week or next where we do some kind of 127 dollar offer to my Brazilian to get two lists– four for that particular course. Pretty big course, lots of stuff in there haven’t really formerly relisted. So once that sort of built, I will take a segment of my list and expose them to that but here’s the segments that I’m going to expose that Steve. So I think what a lot of people would do is they take– okay it’s time to test this page. I’m going to send my list to this page; I’m going to send this to my list. List is a really dangerous term. You’ve probably heard the term like blast emails or whatever. So blast email is really just unsophisticated boat a ride offensive marketing, and you know it’s what people do when they don’t how to market stuff. So they just send the same email to everybody whether you bought or whether you didn’t buy, whether you– you know no matter you’re interested in, no matter what level you’ve purchased at, no matter what lead source you’re from, everybody gets the same message you are a customer, a year ago you’re a customer now. You’ve been on lead for two weeks. Everybody gets the same email all the time. That’s just called like you know sucking it marketing basically. I mean the short hand for that is just being actually bad at legitimate marketing. So what we do is you know we’ll say okay who’s raised their head and explicitly said, I’m interested in take downs. Take downs is what I’m here for Dan. So we have a survey that everybody on our list will eventually get a send to them in about 11 days deep into being in our system, and then they’ll be reminded that if they don’t fill out which asks them for all their various interest areas, and they can tell us what they care about and what they don’t, because I don’t want to hear about take down Steve, if they are not here to learn from me about take downs, then why would I want to bother? You know, I only want to send them what they like, so we have a survey that helps tailor those messages. So what happens when a final list is built or a new offer is constructed is all saying, who’s told explicitly they want that? And maybe who has spent at a relatively consummate level in the past. So we are not going to send this 127 dollar offer to zero dollar buyers, we are going to send it to people that have spent 100 box or more in the last 60 days. That’s who’s going to get that offer because that’s not going to offend them. The seven dollar buyer in the brand new guy, I probably not going to send it to them, probably not, and the guy– but the guy who said even if he didn’t buy, the guy who’s said he was interested in take downs, I probably still will expose him but only because he raised his hand. So you can see Steve how we calibrate exposure based on standing interest? Steve: Yes so, It sounds like you really need a program like infusion soft and just a regular email marketing program will probably not be adequate enough to do this. Faggella: Yeah, yeah with some of it right. So you can do some basic segmentations some other programs, but at the end of the day like it boils down to this and I actually nothing against infusion, in fact I– I mean they’ve built a far – they’ve built a fantastic company. Their logo is adorable. They are– all the staffs love them because they have a free trial. I think their emails honestly look great on phone and everywhere else but when you get to a certain level, you don’t use mail chip, period. You know it’s just– it is what it is, it’s like you know if you are raising cars, you know it’s like a certain level of cars raising, you know, like a certain level of a car partition where you no longer take, you know, your jail prison or whatever. You know it’s not like mail chip is a bad product or it’s not a rickety product, but it is good for a certain number of things it does not– if you say I am going to make as much money from my email list as humanly, visibly, considerably possible mail chip isn’t your bag, point blank period. So yes you do need something that can actually segment, that’s infusion, that’s product, that’s entrepreneur, that’s something with some actual functionality. Steve: Okay, sounds good that’s extra advice. Well Dan I don’t want to take up too much of your time, surprisingly we’ve already been talking for almost 45 minutes. So, yeah, exactly and you’ve given me a lot of things to think about as well with my own email marketing. Steve: And for that I’m very appreciative and– so where can people find you if they want to contact you about anything. Faggella: Yeah of course man. My main sites though orderly enough now when I moved to Cambridge, I am planning on selling the martial arts business and where I share all my stuff about email marketing and marketing automation is clvboost.com [inaudible] [00:44:01] for customer live time value boost but clvboost.com is one of the site for our consultancy. We have a basic white paper that kind of breaks down a lot of plug-in play strategies, so people are like ah you know I’m interested in doing some other segmentation. I do want to understand email a little bit better, that’s about a simple soot to not break down as we have this right down that site. So people want to get a hold of me, they can reach me that way. Steve: Okay, sounds good Dan. Well, thanks a lot for coming on the show really appreciated. Faggella: Thanks for having me Steve. Steve: Hi man, take care. I actually learnt a ton from Dan today about email marketing. Now this episode was recorded about a month ago and after talking to him, I completely revamped my own email auto responder sequence and my info product has actually been converting like crazy. Now I’m not sure if it’s the new mail sequence or the podcasts that’s been bringing the business, but business has been picking up dramatically ever since Dan’s interview. For more information about this episode go to mywifequitherjob.com/episode24 and if you enjoyed listening to this podcast, please go to I-tunes and leave me a review. When you write me a review it not only makes feel me proud but it helps keep this podcast up in the ranks so other people can use this information, find the show more easily and get awesome business advice. It’s also the best way to support the show and please tell your friends because the greatest compliment you can give me is to provide a referral to someone else either in person or to share it on the web. And as an added incentive, I’m also giving away free business consults to one lucky winner every single month. For more information about this contest go to mywifequitherjob.com/contest. And if you are interested in starting your own online business be sure to sign up for my free six day mini course where I show you how my wife and I managed to make over 100K in profit in our first year of business. Go to www.mywifequitherjob.com for more information, thanks for listening. Thanks for listening to the My Wife Quit Her Job podcast where we‘re giving the courage people need to start their own online business. For more information visit Steve blog at www.mywifequitherjob.com. Wow, what a timely interview. This gave me some great ideas for understanding my target audience and their needs. Thank you! Thanks Steve and Dan for letting me be a fly on the wall to your great discussion. It’s VERY refreshing to hear some smart business owners talk about ways to work smarter, and sometimes harder than the competition. The Black Lambo idea was great. Mj DeMarco drives a yellow one, does that count? Wow, you have got the email marketing system absolutely dialed! Thank you ever so much for discussing it, it made me think of a lot of different possibilities going forward!